From left, Town of Southampton Parks and Recreation Department workers and CSEA members Matthew Krops, Kenny Williams, Mat Mordente and Brian Bowden. 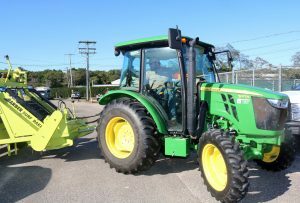 HAMPTON BAYS — With the colder weather approaching, municipalities all over Long island are preparing their communities for ice and snow. Thanks to CSEA members in the Town of Southampton Unit who work for the town’s Parks and Recreation Department, residents don’t have to worry about preparedness because our members are always on top of their game. “We get the salt that the Highway Department has stored in their yard and we have it delivered to our department yard so we’ll have it for the guys that clear the sidewalks,” said Mordente. When winter weather inevitably hits, unit members are prepared to deal with the unpredictability of Mother Nature. Typically, when a snowstorm comes through, unit members work through the duration of the storm. 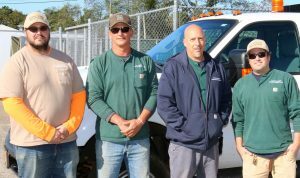 When needed, unit members work with the town’s Highway Department to ensure the town is ahead of the storm.“Sometimes if [town Highway workers]have a downed truck or broken equipment, we may get a call to help them load a truck or clear a certain section of a road with the sander,” said Krops. Our members also are happy to field requests from town residents year-round. Our members at the Parks and Recreation Department do so much that it’s hard to put a limit on their responsibilities. Even in the warmer months, our members stay busy maintaining parks, setting up for park events, cleaning beaches and maintaining the marinas. With such a large area to cover, predictability isn’t much of a possibility. Matthew Krops pulls out the beach cleaner that Parks and Recreation workers use to clean the beach each day during the summer. With the recent pine beetle epidemic on the east end, our members have seen a spike in the number of dead trees that they need to clear. Clearing those trees is especially important since so many local residents use park trails to exercise. Because our members work in so many areas of the town, it’s very important to them that people know that their jobs aren’t just limited to the parks. 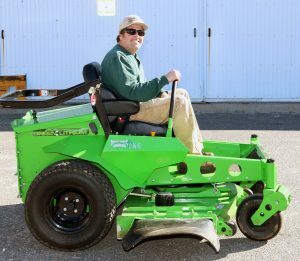 Brian Bowden displays the electric mower that the town has been using for about a year. In the last two years, the town began using electric mowers at the East Quogue Village Green and Southampton Town Hall. “It really helps lower the amount of fumes emitted into the air and helps control noise levels,” said Bowden. Through all of their labor-intensive work, our members never forget their personal ties to the community.